The remodeled atmosphere is lighter and brighter, and I love the giant mural of Koi over the sushi bar. I peeked into the back dining room, which doesn't look as cozy as it once was and has a TV on the wall (the sky is still there of course). We started with an appetizer of Seven Spice Calamari, hoping it was what we had enjoyed pre-Ike. However, this isn't the same dish, and we learned that the one we love is served only during happy hour. So we'll be back for that. The Seven-spice version was too spicy for me but my companion devoured it and declared it crunchy and savory. I tried their Miso soup, which was very salty. It had tender, creamy tofu at the bottom, but overall unremarkable. For entrée I chose the well-named 12 oz "Sumo" NY strip, with the teriyaki/wasabe glaze on the side in case it was too spicy for me. This came on a bed of grilled vegetables with wonderful sticky rice. The meat was flavorful and tender. The sauce did not seem hot at all, but was reminiscent of a honey-mustard, and I enjoyed slathering steak pieces with sauce. My companion took a gamble and ordered the "Royal Flush" entrée, skewers of barbecued beef, chicken, shrimp, tuna and veggies, topped with teriyaki sauce on crispy rice noodles. This dish is a winner, attractive as well as delectable. The beef, chicken and tuna were tender and well-flavored. The shrimp was fresh but a bit overdone. The serving was very generous and could have satisfied two moderate appetites. We finished up with Tempura ice cream, vanilla ice cream wrapped in batter and fried. I will never understand how they do that without melting the ice cream. But it was delicious. Hot and cold, crispy and creamy all rolled into one. An ice cream fritter! Overall this was a thoroughly enjoyable dining experience. I am not a sushi fan so I cannot comment on the sushi menu. From my perspective, Sky Bar has come back full force and is definitely worth a visit. 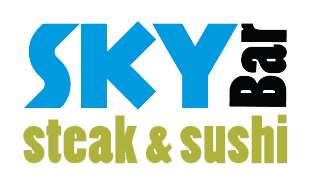 "It would be hard to find a trendier restaurant in Galveston than Sky Bar. It serves creative sushi combinations made from sea bass, tuna and salmon in an ambience that seems to have more in common with Santa Monica than the nearby Strand district of Victorian splendor."